Krnan was 2.5/4 against the GMs he faced. Material is even and both sides attack each other’s pawns. What do you recommend for black? The King’s Indian Attack can be tricky to defend against. In the feature game, Hungarian GM Banusz defends in classical fashion refusing to give any space advantage on either wing. After white tries to force the issue on the kingside, the defense sprang to life and energetically took over the game. 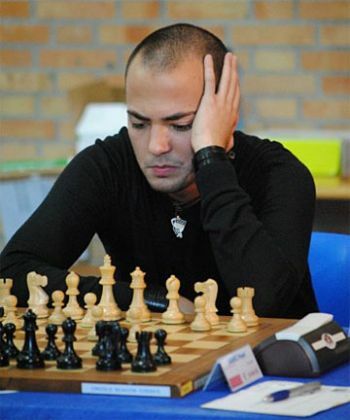 Hungarian Grandmaster (2011). Hungarian U16 Champion in 2005, Hungarian U20 Champion in 2007. Porto San Giorgio Open 2011, 1st. Black has successfully infiltrated white’s position and is looking for the next logical step. What do you recommend for black?